a world-class education through effective and innovative teaching based on the principles and objectives of the International Baccalaureate Organization. a learning environment that equips students with essential skills, concepts, and knowledge. a safe, supportive and positive learning environment to meet the needs of each student. opportunities for students to work both independently and collaboratively with the goal of helping them to learn to solve problems, meet challenges and develop a respect for the aspirations and perspectives of others. a truly international education that enables children to play a full and active role as global citizens and leaders. an opportunity to take full advantage of the possibilities for enrichment afforded by the cultural and linguistic setting of Thailand. opportunities for students to foster a commitment to world peace based on a spirit of mutual understanding and cultural respect. 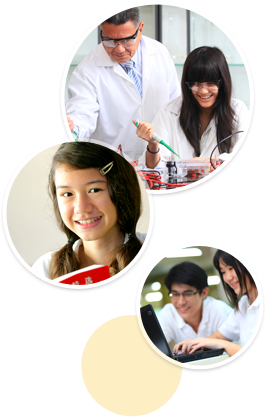 an educational program where English and Mandarin are the main languages of instruction. students with faculty and staff of the highest quality and encourage continued professional development. a sense of community among the students, parents, faculty, and administration, based on open communication, mutual respect, cooperation and concern.